Good!!! !, Anyone know more about this FrameWork? Only a good set of test will tell if VFP9 is fully compatible with Windows 8. Today VFP9 has just a few visual glitches with Windows 7, but it’s fully compatible (not having into account those functions that are not longer compatible with other apps like the append/import commands with office 2007’s excel files). A Metro framework for foxpro would be great. Maybe this is the last OS supporting Foxpro taking into account the support lifecycle ends at 2014.
thanks a lot. good news. Good news, now I will consider to upgrade to windows 8! I’m trying to get this to work myself – when I run it I get a c000005 error right after the splash screen – can you tell me the steps you did to install? All I can tell you is that I installed the Developer Preview of Windows 8 on a virtual machine using Virtual Box. I then installed VFP9, and applied Service Pack 2, as well as all the HotFixes that have been released for VFP9. As I recall, the VFP installation installed a few .Net thinhs as well, but I don’t remember the details. Good luck, and let us know if you get it running. Thanks for the work you’ve done, and for sharing this. Hopefully there will be FoxPro apps to build and maintain for years to come. Maybe we can get together for lunch, soon. Best Luck to all VFP Programmers who is still working in the world of VFP…….!!!!!! 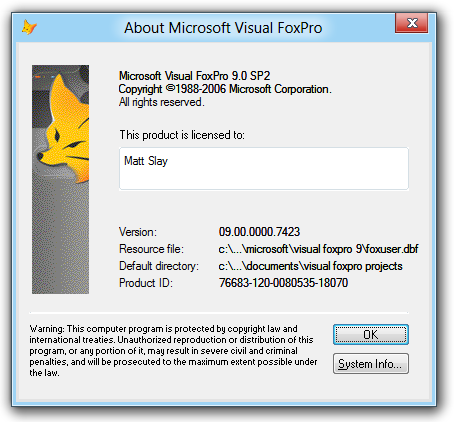 Can Visual Fox 7.0 SP1 run on Windows 8 ??? I don’t know. I have VFP 7, but I do not use it, nor do I plan to test it. Perhaps someone else has or will. If it’s truly important to your enterprise, you should test it and let us know. Creating a Windows 8 VM is easy. Give it a try. If I understand correctly, VFP, as a Win32 app, will not do Metro. Of course it will not run as a Metro. No app written for regular Windows will run as a Metro app. Windows 8 will throw off to the old shell to handle all previous generation of apps. This is not a limitation that’s unique to FoxPro. Just do the frontend in jQuery or jQuery Mobile with HTML 5 and the backend code and data in VFP in an mtdll. Simple. I would love to know if VFP9+All Fixes apps will run on a Win8 Tablet. Any idea? 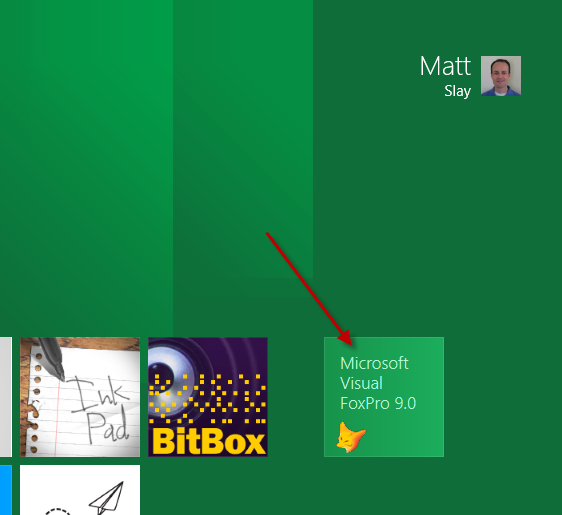 Foxpro message box titles are centered. Why is that? Interesting. I had not noticed that. Who can say why this is happening. What verssion of Win 8 are you testing on? The “Release Preview” version? Maybe this will be noticed in other applications and will get fixed in the Release Candidate or RTM verison. Thank you by the greath news!!! Muchas gracias, me parece una excelente noticia. I didn’t see this in the comments, but it’s important. There are two flavors of Windows 8. One that runs on Intel processors and one that runs on ARM processors, called WinRT. If you have a WinRT device, you can’t install any application that doesn’t come from the Windows store AND that application must run in Metro mode. The only things allowed on the desktop are preinstalled Office and IE. This means that your VFP app will not run in WinRT and won’t run on an ARM device. On an Intel device, it will only run in desktop mode. Fantastic news! long live to the Fox! I didn’t see this in the comments on VFP 8, but it’s important, but VFP 9 the same in the code in program, please explanation on windows 8 grather than. Hi – I want to load VFP 8 on windows 8. Doesn’t seem possible. I was thinking I would load it and upgrade to 9.0. I don’t want to have to purchase VFP 9.0 on it’s own. Can you help? What does you mean by “Doesn’t seem possible.”??? How about windows 8 profesional version? Will vfp 9 running on that version? My latest version is 09.00.0000.3504. My computer is slowly bowing out gracefully. Will this version run on Windows 8? On a PC with Windows 8 64-bit on the ODBC driver does not show VFP9. Does anyone know how to solve? To take into account, using SysWOW64 \ odbcad32.exe not work. Not a framework for windows 8 but…. The last one uses my Easing Class library for different easing styles. I am running my VFP application of windows 8. It runs well, but the images don’t show, all I see is a grey box. The methods seem to work, the pictureVal is correctly set, but the graphics don’t appear. The same software runs fine on Windows 7. What has happened, do you know the problem? I do not know, but I hope you have asked this question over in Universal Thread or on Stack Overflow. results in “123456” on screen, but “123 456 ” in file. I get the same results with VFP 9 SP2 on Windows 7, so this is not unique to Windows 8. You’ll need to seek help on some FoxPro Help forums. Interesting- I had been running VFP 9 SP2 on Win 7 for more than a year and did not have the issue. A couple of programs I run broke when I installed Win 8.1, so I assumed that was the cause. I just tested on a laptop with VFP 9.0 SP2 9.00.0000.5815 and Win 7 Ultimate SP1 64-bit, and the program works correctly. If you see the issue under Win 7, then maybe it’s a setting – perhaps a font or DPI setting in Windows? I looked through many VFP options and properties, but didn’t see anything obvious, and I don’t think I changed anything in VFP when moving from Win 7 to Win 8.1 anyway. Do the runtime libraries go in the same location as Win 7? I am not installing VFP just want to run an exe on Win 8. Note that it is pre-pending “PROCEDURE FORM1.LOAD” to the actual value. This is on Windows 8_64 with VFP 09.00.0000.7423 (this is latest). I can confirm that I do get the same result on my machine which is the same exact setup as yours. I think you should play it save strip out all the preceding text from the beginning of that string, and get to just the real filename part so that FullPath() will return the correct value. But I understand you concern is to figure out if VFP on Windows 8 is returning a different value. You need to post this on Universal Thread or Foxite or StackOverflow where you will get better community response to help you analyze this issue. Would you be able to send me the hotfixes or post them for download? I am unable to locate a download for them. The SP2 download did work, but the hotfixes are dead links. I’m having problems using ink controls on a vfp app on Windows 8.1, which gives an ole error, but the app works fine on both Windows 7 and 8. I’m attempting to install VFP 9 via CD and It seems as if it is hung up on the prerequisite installation. Everything seems to install fine for the setup files and the SOAP toolkit, but it always returns to the prequisite install. Sorry, but I have no idea what the problem could be. I suggest posting your question on Universal Thread, or perhaps Foxite, or Stack Overflow. I figured it out and thought I’d pass the info along to you. Once I’d mounted the ISO, I executed the setup.exe at the root level of the ISO. This is the one that loaded the setup files and the SOAP Toolkit, but it would never advance to the Install Visual FoxPro option. So, I drilled down into the Setup folder on the ISO and executed the setup.exe found in the Setup folder. It was no problem from that point on.